We can provide reports anywhere in the country either in person or now in an online report. Both are accepted by the UKBA and we have an enviable record in producing reports for people who obtain their visas. Try out our free assessment tool , order our Priority Online Report for delivery within 10 days, or have us contact you to answer any questions you have. 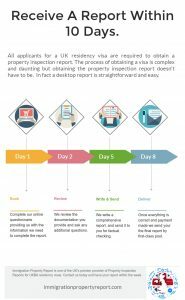 Obtaining a Property Inspection Report for UKBA is required to receive a UK settlement visa. It sounds a daunting task but in reality it is simple, especially with our new Priority Online service which removes the need to arrange for an inspector to visit. Whichever service you choose, you will receive a detailed and comprehensive report by qualified and experienced Environmental Health Officers. These are the two types of inspection report available. A Priority Online Report is available across the country, even where a physical inspection is not possible due to location or time. You complete an online questionnaire, including providing measurements of the rooms, photos and floor plans (if available). This is our recommended option for most cases since it is quick, convenient and guarantees a report anywhere in the country within 10 days. Immigration Property Report work with qualified professionals across the country. This means that wherever you are we can help you get your Property Report – and do so quickly and cost-effectively in a respectful way. Our Priority Online Report service can be completed without a physical visit and will guarantee a report within 10 days. Alternatively, complete the form below. We will then contact you to ask you some questions, tell you the documentation we require at the assessment, and arrange an inspection at a time that is convenient to you.